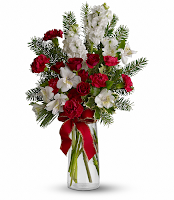 As we get closer to the holiday season, the Bloomex blog is going through 12 great arrangements in an effort to make your Christmas season just a little more festive in 2013. On the second day of Christmas, my true love gave to me... a Festive Fragrance beauty. Ahh, the smell of a crackling fireplace and the earthy tones of evergreens -- that's the smell of Christmas-timeCapture that essence with this festive, gorgeous arrangement. The Festive Fragrance display is always one of our top-selling items during the holiday season and it's easy to see why. The arrangement consists of a seasonal combination of Roses, Carnations, Christmas greens, Alstroemeria and Stock. That's all topped off by a big red bow to drive the jolly feeling home. This display is guaranteed to bring the spirit of the season from the outdoors to the inside of any house or room. At just $34.95, it also makes for a value-conscious replacement or a great space-saving alternative to a full-sized tree for your bachelor pad or studio apartment. You can have a look at this Festive Fragrance arrangement right here on Bloomex.ca. And be sure to check back tomorrow for the third installment of our 12 Days of Christmas series, where we'll take a look at one of our most popular gift baskets! Ahh, the smell of a crackling fireplace and the earthy tones of evergreens -- that's the smell of Christmas-time. Capture that essence with this festive, gorgeous arrangement. The Festive Fragrance display is always one of our top-selling items during the holiday season and it's easy to see why.